Outdoor grilling is not always possible for a variety of reasons – from housing regulations to apartment living or limited backyard space. For those who love the taste of grilled food, smokeless grills are a fantastic option for indoor use. In this article, we take a look at some of the best smokeless grill models on the market. What Exactly Is a Smokeless Grill? How Do Smokeless Grills Work? Our Top Choice for Best Smokeless Grill! Our top pick is the Philips Smoke-less Indoor Grill. It does an amazing job of maintaining the ideal temperature for indoor grilling, and it’s extremely easy to clean. Also, its elegant design means it will look great in your kitchen. The Tenergy Redigrill is very similar to our top choice in design and appearance – it even heats up to the same exact temperature, 446°! However, it is not quite as refined in appearance and comes from a less established brand. For keeping your counters clean and cooking for a group, the Power Smokeless Grill has a large grill and tempered glass lid included. Looking for the temperature versatility of a larger grill? The KRUPS Smokeless Indoor Grill has two separately controlled cooking surfaces. Described as a “less smoke” model, the Hamilton Beach Electric Indoor Searing Grill is a relatively small and lightweight option that has a lid and convenient drip tray. Our top spot goes to the Smoke-less Indoor Grill from Philips, which utilizes infrared technology to ensure even heat distribution during cooking. This model prevents drips from coming into contact with the heating element, reflecting heat from the element towards the food. The cool drip tray catches any fat or marinade, minimizing the amount of smoke produced. At roughly 15 pounds, moving this grill around and storing it away, if necessary, are no problem. Easy to use, this grill has a single switch with 3 settings – off, hot, and keep warm. When cooking, the grill heats up to 446°F and maintains itself at that temperature. This means you can focus on grilling your food to perfection rather than fussing with the temperature controls. Clean up is also a breeze with the aluminum-coated grill and drip dray, both of which are easily removed and dishwasher safe. The aluminum-coated surface keeps the heat even and produces grill marks that you would achieve on a standard outdoor grill. This grill has rubber feet, so you won’t have to worry about it sliding around. Note that there’s also a rotisserie attachment available, which provides constant rotation for perfectly roasted meats and vegetables. One negative is the lack of a lid. While it’s designed to minimize side splatter, some counter cleanup may be required depending on what you’re cooking (and how much). Another grill utilizing advanced infrared technology, the Redigrill from Tenergy uses indirect infrared heat to provide even temperature across the grill surface. This ensures no cold spots. The easily removable drip tray is kept away from the heat, staying cool enough to catch fats and marinades before they burn and produce smoke. 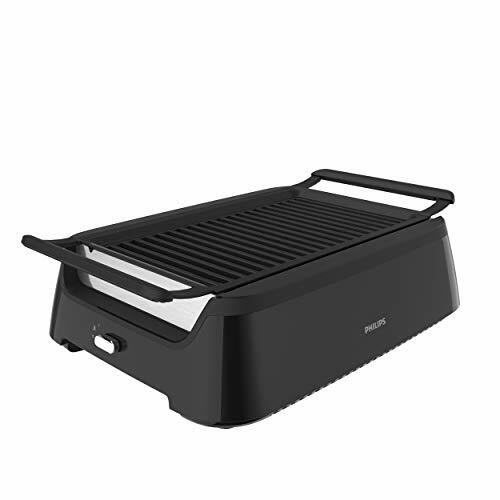 Like the Philips grill above, this Redigrill has just a couple cooking options – hot and keep warm. It will heat up to 446° F in 6 minutes. This is considered to be the ideal indoor grilling temperature, and again this matches the Philips model. This temperature is constantly maintained, so you won’t have to worry about the grill getting too hot or cold. With a non-stick grill and easily removed drip tray, the Redigrill is easy to clean and is largely dishwasher safe. This particular model is also designed with safety in mind, considering it is designed for use indoors. The grill is certified safe by North American ETL standards and has an automatic shut off should the internal grill temperature get too high. With a grilling surface of almost 14 inches by 8 inches, the Power Smokeless Grill has enough space to evenly cook 6 large burgers or 3 racks of ribs at a time. Grill size alone makes this model one of the best for cooking for a larger group. Featuring a Super Non-Stick Cerami-Tech Coating, you can rest assured nothing will stick. No extra oils are required, meaning a healthier end result. This Power grill has an LED Smart Temperature Control panel, offering fully customizable heat settings and maintenance up to 450°F. Precise temperature control allows for even heat distribution and foods cooked to your exact liking. 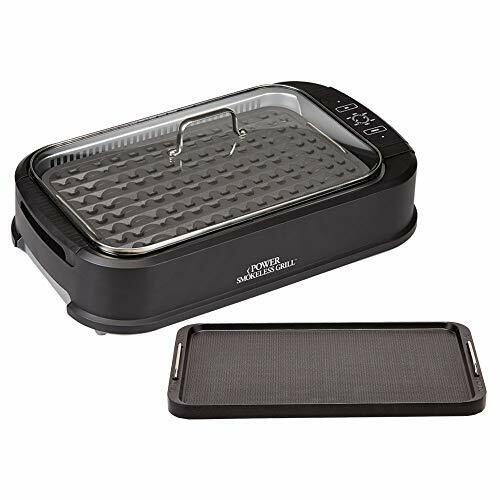 The removable grill makes clean-up a breeze as it is dishwasher safe, and offers versatility as it is easily exchanged with the included griddle – perfect for pancakes, eggs, and grilled cheese sandwiches. Offering built-in Turbo Smoke Extraction, this model is virtually smokeless. The extractor captures and extracts nearly all of the smoke produced by falling fats and moisture. Weighing just over 17 pounds, this slightly larger grill is still extremely portable if need be, though it takes up a little more counter space. With the addition of a dishwasher-safe tempered glass lid, you can keep your work area free from splatters while cooking. The KRUPS Smokeless Indoor Grill offers 2 cooking areas which can be heated separately to different temperatures. This model offers the versatility of a larger, traditional grill on a smaller scale. Each grill area has an independent control switch, enabling you to cook different foods without fear of under- or over-cooking. The control panel allows for warm, low, medium, high, and sear temperatures, with a range of 200°F to 450°F. Each individual control panel has two indicator lights – one to show the grill is on, and one to show it has reached the set temperature. Edge-to-edge heating elements make sure every inch of the non-stick grill surface is heated evenly and to the correct temperature. While some smoke is expected due to moisture dripping from the grill, most of it is directed away. Both the individual grill plates and the drip tray are removable and dishwasher safe for quick and easy clean-up. Weighing just 10 pounds, this smokeless grill is lightweight and portable. It makes a great addition for camping or tailgating. This model also includes a handy cord wrap on the back of the grill, keeping the cord safely stored while not in use. The lightest on our list, this grill from Hamilton Beach weighs just over 8 pounds. Using only 1200 watts, this grill is easily transportable and perfect for cooking in an RV, in addition to the kitchen. While it’s smaller than some other indoor grills, it still offers an adequate 118-square inches of grill space. Controlled with a switch, this grill offers temperatures ranging from 200°F to 450°F. This allows you to precisely control the temperature, depending on what you grill. At its hottest, food is given a beautiful sear, much like on a traditional outdoor grill. Heat retention and overall food flavor are boosted by the included hood, which is easily removed for cleaning. The hood also prevents splattering on your countertops. Cleverly designed, the heating element is the grill surface itself, providing even heat distribution. This reduces smoke through contact and any fat or marinade is caught by the extra-large drip tray below. All removable parts are dishwasher safe for easy clean up after use. This model features an on-off light and pre-heat light to let you know when the set temperature has been reached. Compact and easy to carry, this potentially portable grill is also easy to store if you don’t have much counter space. While traditional grills use burning fuels like propane, charcoal, and wood pellets to cook food, a smokeless grill works differently. Powered by electricity, smokeless grills often use infrared technology and reflective coatings. They are typically built so that fat and other drippings don’t fall onto hot areas. And while they greatly minimize smoke, especially compared to a traditional outdoor grill, they are not 100% smoke-free. Just like when you’re cooking on your stove, a minimal amount of smoke is inevitable when cooking at 400°+ degrees. On a typical grill, fats and other liquids cause smoke and flare-ups when they drip onto the fuel source below. Smokeless grills combat this in a couple of different ways. The first is by using infrared technology and carefully placed reflective surfaces. The heat from the infrared source is reflected towards the food rather than positioned directly under it. This allows moisture drops to fall on a cool collection plate rather than the heating element itself. While fattier cuts and heavily marinated foods will still smoke a little, this setup greatly reduces the amount of smoke produced. Another way smokeless grills reduce flares is by using an electric heating element beneath the grill. Carefully designed to ensure even heating, the placement of the element beneath the grill reduces the amount of moisture that comes into contact with it. This subsequently reduces the amount of smoke produced as well. Some smokeless grills have a built-in extractor fan, which also helps. Do you want complete control of your grill’s temperature, or are you okay with a simple on/off setting? Some grills on our list have only a couple cooking settings (‘hot’ and ‘keep warm’), while others allow complete control. When choosing a smokeless grill, make sure you’re getting the level of control that you want. With no burning fuel, clean-up should be much easier with a smokeless grill. Many models offer removable drip trays for any fat or marinades that fall. More often than not, the grill surface itself has a non-stick material coating, like ceramic or aluminum. While many models tout their removable parts as dishwasher friendly, you should bear in mind that non-stick surfaces last longer when hand-washed. Some smokeless grills are considerably larger than others. And here’s a tip: they can be much larger than they look in the photos. It’s advisable to measure the counter area where you plan on keeping your grill, and compare it to the dimensions of the model(s) you’re interested in. Weight, on the other hand, probably won’t be much of an issue for you. For example, the heaviest grill on this page is still under 20 pounds. If you need to store away your grill, moving it won’t be a chore. The weights of these smokeless grills also mean that they are suitable for tailgating, camping, or RV use. It is hard to beat the Philips Smoke-less Indoor Grill. Even heat distribution, simple operation, and easy cleaning make it our #1 choice. 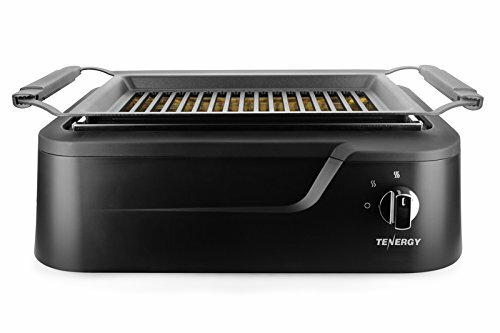 However, the Redigrill from Tenergy is a quality substitute, perhaps lacking only in appearance compared to the Philips model. 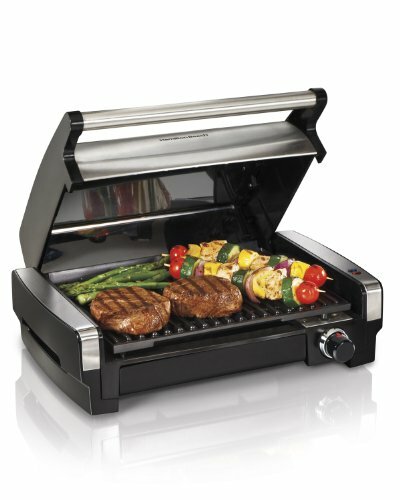 If you’re looking for a smaller grill, the lightweight Hamilton Beach Indoor Grill is an excellent option. Love cooking for larger gatherings? The grill area of the Power Smokeless Grill gives you so much space to cook. Lastly, for the temperature versatility of a larger grill, the KRUPS Smokeless Indoor Grill is a top choice. Have experience with any of these grills? Any questions about them? As always, don’t hesitate to let me know in the comments below. What are the Best Wood Pellets for Smoking and Grilling? Best Electric Grill for 2019 and Top 5 Guide!